You would be hard pressed to find better value for your cinematic dollar than the small program that Johnny Larocque puts together for his annual Lost Episode Fest (LEFT). 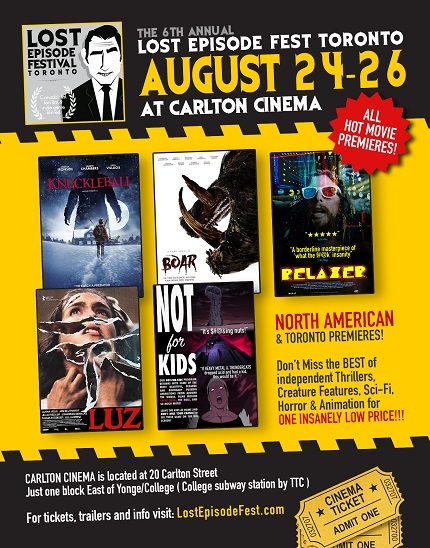 Now in it's sixth year the festival rolls out for the last time at the Carlton Cinema here in Toronto (a different story for a different time) next weekend from August 24th through 26th. LEFT will have the Toronto Premieres of Knuckleball, Luz, Relaxer and animated feature Crisis Jung. LEFT will also have the North American premiere of creature feature Boar. And right now, Johnny has just informed us that the festival pass is on sale for half price, $25! Five bucks per movie is not bad. Not bad at all. Hop to it. Get your all access pass here.